(Nanowerk News) From flocks of starlings to schools of fish, nature is full of intricate dynamics that emerge from the collective behavior of individuals. In recent years, interest has grown in trying to capture similar dynamics to make self-assembling materials from so-called "active matter." Brown University researchers Kyongmin Yeo, Enkeleida Lushi, and Petia Vlahovska have shed new light on a particular class of active matter called active colloids -- collections of tiny moving particles suspended in fluid. Using numerical models and computer simulations, the researchers show how spinning particles, pushed about by the fluid flows created as each particle spins, can arrange themselves into an array of emergent macro-scale patterns. 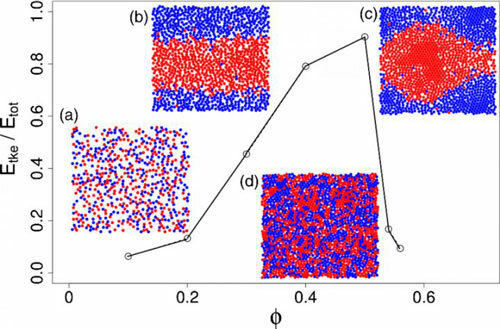 The research, published recently in Physical Review Letters ("Collective Dynamics in a Binary Mixture of Hydrodynamically Coupled Microrotors"), could help engineers to understand the dynamics of these systems and design new materials using rotating colloidal particles. The study of active colloidal rotors is relatively new. In the last few years, several experimental groups have shown that individual particles in fluid -- when coaxed to spin by magnetic or electric fields -- can form interesting collective structures. For example, one group recently showed that millimeter-scale wires can assemble in this way from ferromagnetic micro-particles. The researchers at Brown aimed to use computational methods to try to better understand just what mechanisms are behind these emergent patterns. For this particular study, the researchers were looking specifically at how fluid flows can impact such systems. "The problem with complex systems like electromagnetically driven active colloids is you don't know which dynamics are coming from which interactions," said Lushi, a postdoctoral researcher in Brown's School of Engineering. "So we wanted to step back and look just at what the fluid does to the pattern formation, since the fluid environment is always present in these systems. Then in the future we can scale up and combine that with other interactions such as electric or magnetic and compare with experiments." Lushi and her colleagues simulated a system in which half the particles spin clockwise and the other half spin counter-clockwise. "As each particle rotates, it creates a disturbance in the fluid and that affects the neighbors," Lushi said. "The particles interact through the flow disturbances they create and also by direct collisions." The simulations showed that at low particle concentrations, the fluid pushes the particles chaotically, in no discernible pattern. But as the particle concentrations increase, patterns begin to emerge. At a certain point, the particles begin to segregate according to spin direction -- forming distinct "lanes" of particles with the same spin. As the concentration increases, small swirling vortices of same-spin particles form. At still higher concentrations, a large hurricane-like structure of same-spin particles forms. But if the concentration is too high the particles just jam into crystals and cannot segregate anymore. This is the first simulation of its kind that has tried to account for effects of fluid flows in populations of rotating colloids, the researchers say. The results underscore just how important that fluid flow can be in these systems. "Even just that simple interaction -- rotation creating disturbances in the fluid -- gives us all this complex behavior," said Vlahovska, associate professor of engineering at Brown and the paper's senior author. "At the micron scale, you can't ignore the fluid. It's a force that has to be reckoned with." Ultimately, the researchers hope that simulations like this one could help scientists to harness emergent behavior to make new materials. "It is expensive to do experiments in the lab, hoping to discover just by serendipity some new behavior or new material," Lushi said. "Computer simulations are much cheaper to perform, and can give experimentalists a useful set of parameters for what kinds of interesting dynamics could be seen in the system."